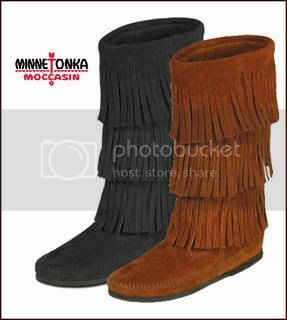 Totally Geek to Totally Sheek: Minnetonka Again? So I get a lot of spam emails from fashion websites that I peruse occasionally. Ok not occassionally, a lot, but whatever. And usually I can sort of see where the trends are hitting and then try and find my own personal way to incorporate it into my already hobo/conservative/inappropriate for my age look. But today man, I was just sort of like, oh Lord, again?!? Minnetonka's are back. They're the indian inspired mocassin version of the Ugg. A couple of years ago they were here and fierce in mocassin indian slipper form. Now however they're tall and bootlike. Listen, I don't mind repeating trends but can't we find some way for the girls down south to enjoy. Honestly pee-pol! I'll still buy then, but I don't have to like it. And here is the rest of it.